Ceramic SMT Capacitors are very small, they are usually brown or cream colour with metal ends. They type you will find on computer equipment are MLCC or Multi Layer Ceramic Capacitors. As they are capacitors the PCB is marked C and then their reference number is next. This is a common way of marking the PCB. 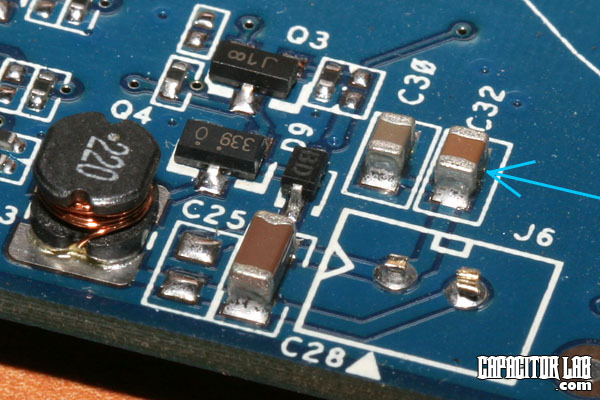 If you take a look at the C25 position you will see that there is no capacitor there. There are two solder points where a capacitor could be added. As these capacitors are SMT or surface mount they are placed by machine on the top of the PCB and the solder is in fact solder paste. It is possible to hand solder one into position but it is quite a fiddly job, still it is not impossible. To see how small they are you can check the above pic which indicates the same area of the Asus 6600GT graphics card that is taken very close up in the first pic. Please note the fan power connector is removed in the first pic. Actually they can fail and there was even a class action against Sony for a series of Camcorders which stopped working. This was due to many failed MLCCs in the Camcorders. Still it is not a very common failure point and on motherboards you can ignore these capacitors because if the motherboard is not working it is most likely some other issue. A common damage to a motherboard is knocking one of these capacitors off the board or receiving a board with one or two missing. If the board is not working you could try to solder a replacement one into position or otherwise the board might work fine without. An interesting thing about these caps is that they are non-polar and therefore not sensitive to polarity reversal, so you can solder them whichever way round that you like. How to Identify their Values? This is the problem with some SMT components. 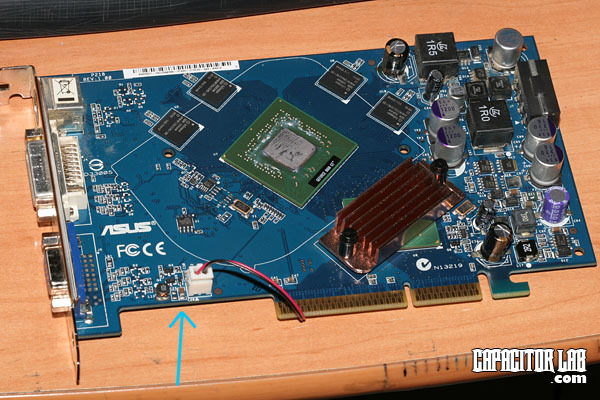 It will probably not be possible to identify the value of these types of caps, which is where donor motherboards come in useful that you can use to provide similar looking parts from the same type of areas. A curious remark about ceramic capacitors is that they can make a microphonic sound under certain conditions, a kind of hiss. If they were not doing this in the first place, the failure of electrolytic capacitors in a circuit can cause them to start singing.